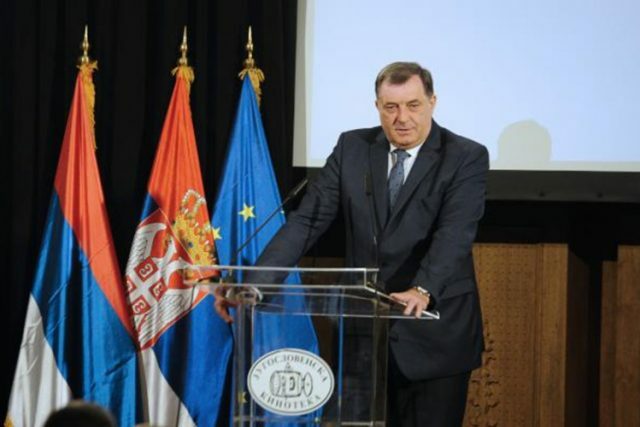 Republika Srpska President Milorad Dodik has said that it is important for the Serbs to make a request to declare the suffering of the Serbs in the fascist Independent State of Croatia /NDH/ a genocide.“It is important for us to find the strength, financial resources and efforts to further explain the events and sufferings caused in the fascist-genocidal NDH,” Dodik told the reporters, after he attended the central event marking 75 years since the start of the WW II in the former Yugoslavia in the Yugoslav Film Archive in Belgrade. He has stressed that the Serbs cannot accept the attempt by the caricatures to declare Srebrenica genocide, in spite of grand manipulations and pressure. “This, of course, was not genocide, but a great suffering, a great crime. People are hold responsible for this,” said Dodik. He has noted that the Serbs do not hide those who committed crimes in Srebrenica, but cannot accept the qualification such as genocide. According to him, if the world were fair, declaring the NDH crimes genocide would have happened earlier. When you go through the facts of that time you cannot say it was not genocide, but obviously, Europe is not interested in it,” said Dodik. He said there were initiatives which, he believes, should be strengthened, and that there should not be any serious conversation without insisting on it. Dodik has said that the Serbs unjustifiably failed to emphasize and, in some strange way, to insist on it in order not to irritate others. “I think it is a historic moment to request actualization of this issue,” said Dodik. He has reminded that the greatest sufferings of Serbs are related to the 40’s of the last century, as well as to the fact that the Jasenivac Concentration Camp did exist, and was the product of NDH and its fascist ideology which main aim was to destroy the Serbs in all regions, not only in Croatia, but in BiH, too. Dodik has said that there was no social awareness of other nations to protect and defend Serbs at that time. He has recalled that there was a children’s camp in NDH where, according to their data, more than 40,000, children, mostly Serb children, were killed, which reflected the intentions of NDH. Dodik has said that the great Yugoslav idea, which the Serbs were astonished with, was motivated by providing the freedom first, later a state, to other peoples, while the Serbs were demonized at the end of the last century precisely by those who were given the freedom. He has recalled the fact that mostly Serbs were the partisans and the uprisings against fascism in BiH and Croatia started in areas 100% populated by the Serbs, which shows that only Serbs were aware of combating fascism and rebelling against it, while other peoples were not. Dodik has said there were only few members of other nations who were celebrated in songs and movies recorded in the communist regime that should create confusion. He has stressed that it is essential to mark this date, 75 years since the establishment of NDH and sufferings of Serbs, which is a part of the continuity of the Serbs’ sufferings, especially in the entire system of the concentration camps from Jasenovac to Stara Gradiska, which killed more than 500,000 Serbs. “Of course, forgiving is necessary, but finding peace in forgiveness and the fact that so many people, our compatriots, were murdered in such brutal manner, is very hard. It is therefore important that the authorities of both Serbia and Republika Srpska mark together such important dates in our history, which are mostly the dates of sufferings,” said Dodik.